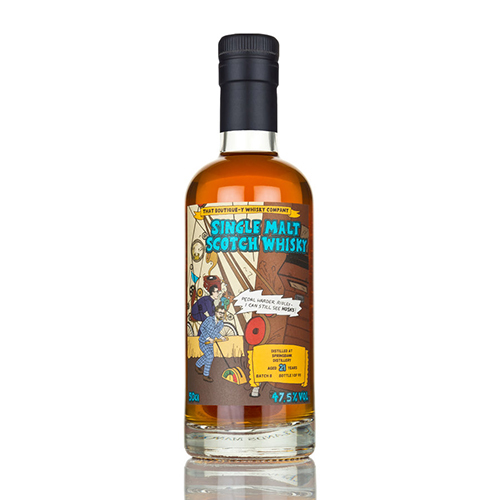 The Springbank distillery is one of a small number of remaining Campbeltown distilleries - it used to be one of the most prolific regions, somewhat akin to Speyside, though today only a handful of distilleries remain. Luckily, the Springbank distillery produces a fantastic array of Campbeltown whisky for us to enjoy, including classic Springbank (lightly peated), Hazelburn (unpeated) and Longrow (heavily peated), and they are all bloomin marvellous. Our Springbank label features Neil Ridley and Joel Harrison (formerly of caskstrength.net) working the old Porteus Mill at Springbank. Put your back into it, lads! Nose: Peat embers and smoked cheese, with sweetness of stewed pear bringing welcome sweetness. Palate: Dark coffee and roasted peach, treacle, sea salt, thick sherry. Finish: Enjoyably spicy with cinnamon and nutmeg. Oily malt lingers.